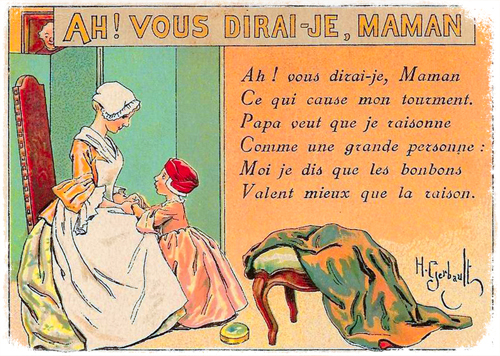 The words of the first parody of the song, which remains best known to French children even today. What just drives me crazy? Is worth more than reason. It loses something in the translation, no doubt. The funny part was that the parody was published as “La confidence naïve”, or “The Naïve Confidence”, turning a heartfelt poem about a young woman trying to sort out her love life into a child complaining to his mother about how his father keeps asking him to grow up already. The connection to the original lyrics is probably lost on modern French children and even modern French adults, but it must have gotten a good laugh in the 1760s. This song achieved international attention in 1785, when a 29-year-old Wolfgang Amadeus Mozart published his “Twelve Variations on ‘Ah! Vous dirai-je Maman!”. Mozart was probably exposed to the song while staying in Paris a few years earlier. Soon after, “The Alphabet Song” and “Baa Baa Black Sheep” were also fitted to the melody. The German Christmas carol “Morgen Kommt der Weihnachtsmann” uses it as well, as do songs in Spanish, Dutch, Turkish and Hungarian. “The Alphabet Song” was copyrighted in the United States in 1835, featuring Noah Webster’s newly promoted pronunciation of the final letter, Z, as “zee” instead of “zed”. Webster’s idea was that the simplified pronunciation was more intuitive, and thus promoted literacy better. Whether that was true or not, it sure lent itself to the rhyme scheme better than the traditional pronunciation. This is by no means a definitive list of versions and parodies. The song’s been around for about a quarter of a millennium. A lot can be done over that much time, so have a look around—I’m sure you’ll find more!